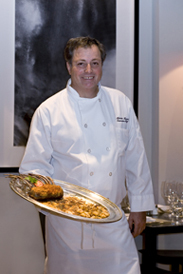 Executive Chef Michele Mazza of Il Mulino New York at Acqualina Resort & Spa on the Beach in Sunny Isles Beach, Florida shares a delicious taste of Italy with his recipes for Soft-Shell Crabs, Fried Calamari, and Ravioli Porcini. Hailing from the Sorrento, Italy region, cooking is in Chef Michele Mazza's blood; his family is involved in the pastry business in Italy. After attending the Italian Culinary Institute in Rapallo, Genoa, Italy, he honed his craft by working on cruise ships around the world where his culinary style was influenced by the many ports of call that he visited. He moved to the United States and ran his own successful restaurants, and joined Il Mulino Restaurant Group in 2003 as Executive Chef. Having stayed at Acqualina Resort & Spa on the Beach and having dinner at Il Mulino New York in May 2009, I was interested in learning more about this interesting chef. When I asked him about his program of cooking classes that are held in the suites at the hotel for adults, and in the restaurant Il Mulino New York for children, Chef Michele replied that as someone who learned to cook early in life, he enjoys sharing his passion with others. Chef Michele Mazza changes the menu often at Il Molino New York according to the season, and always looks forward to the time of year when soft-shell crabs and zucchini flowers arrive, and in the winter, he likes to add venison recipes to the menu. He graciously shares a taste of Il Mulino New York until you can visit the restaurant in Florida. Method: Flour soft-shell crabs, shaking off excess flour. Heat blended oil in a sauté pan. Brown crabs on both sides. Drain all but one teaspoon of oil; add garlic to pan and cook for 30 seconds. Add white wine, clam juice, lemon juice, and capers. Reduce. Add butter and season with salt and pepper. Presentation: Add spinach to the center of a large round plate. Position soft-shell crabs on the plate at 12, 3, 6, and 9 o'clock. Spoon sauce over the top, and garnish with plum tomato slice and parsley sprig. Method: Place calamari, zucchini, and lemon in a bowl and season with salt and pepper. Add flour to bowl and toss ingredients until completely coated. Shake off excess flour and place calamari and zucchini in a fry basket. Calamari takes approximately 2 minutes to cook. When the calamari and zucchini are done, place on a paper towel to absorb excess oil, and season again with salt and pepper. Presentation: Heat the Il Mulino Marinara Sauce and pour into a small glass bowl and add a pinch of red pepper flakes. Stack calamari and zucchini in a proper napkin fold and place on an oval plate. Garnish the calamari and zucchini with chopped parsley. Place half a wrapped lemon next to the sauce on the plate. Method: Boil the fresh ravioli in salted water for 4 minutes. Drain, and add cream sauce. Cream Sauce Method: In a sauté pan, place 2 ounces of butter and 1 cup of champagne. Bring to a boil. Lower the heat, and stir continuously until sauce is reduced. Then add, 1 cup of cream and 1/8 ounce of black truffle and bring to a boil. When sauce begins to thicken, add the cooked ravioli. Mix together until creamy. Turn off heat, and add Parmigiano and black pepper. Toss to coat ravioli evenly. Presentation: Serve ravioli with the rounded sides facing up. Buon Appetito! 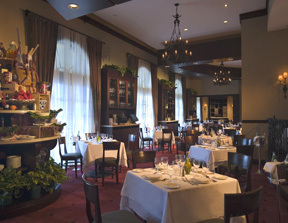 Il Mulino New York is open for lunch from Monday - Friday from 11:30 am - 2:00 pm, and for dinner Monday - Saturday from 5:00 pm - 10:00 pm, and Sunday from 5:00 pm - 11:00 pm. Read other articles on Il Mulino New York and Acqualina Resort & Spa on the Beach in the Hotels and Resorts, Restaurants, and Spas sections. Also read about Sunny Isles Beach and Miami in the Destinations section. For more information on Sunny Isles and Miami and upcoming events, please visit the Greater Miami Convention & Visitors Bureau website: www.GMCVB.com. © June 2009. Luxury Experience. www.LuxuryExperience.com. All rights reserved.